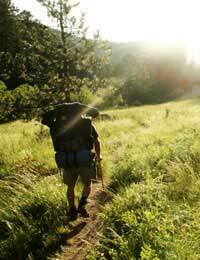 Home > Walking for Beginners > Why Start Hiking? Going walking is one thing, but taking up hiking is another. Walking is usually on pavements or on pathways, the kind of surface that’s intended for feet. Hiking takes you much more into nature, where the tracks are rough and you have to put much more effort into moving. Yet hiking is something millions of people do every year. It might just be a single trip to one of the National Parks followed by a small ramble, or it could be 10 miles or more on a regular basis hacking through the countryside. Something makes us go out there and wander. Why do we hike? Possibly the biggest reason is that it’s a simple way to get in touch with nature. Most of us live in cities; even what were once villages are often now small towns. We’re surrounded by other houses and the closest we get to greenery is the local park. That, in part, was why the National Parks were created. Yes, they’re like the country’s lungs, open and wild, but they’re also a place for recreation, and the easiest recreation of all is hiking. It’s a way of getting out into all the wild country, to see beautiful views, and to enjoy a sense of freedom as the scenery opens up. Being able to feel close to nature at times is part of being human. We need to get away, to lose ourselves among woods or hills. Walking, too, is good for thought, and everyone needs time to reflect occasionally. Doing that out in the wild is a good way to be reminded of our small place in the overall nature of things. If walking is good exercise, then hiking qualifies as great exercise. It’s far more strenuous, not only in the quality of paths travelled, but also the hills – both up and down. A five mile hike in the country is going to take far more out of you than the same distance on city streets. That can definitely be a health plus, and simply being out there can help clear your head. When you’re focusing on where to put your feet or stopping to take in the view you’re not thinking about your everyday problems. So, in addition to physical fitness, it also promotes mental health. Hiking is perhaps the cheapest recreational activity you can undertake. You can spend hundreds of pounds on gear if you choose, buying expensive jackets and the like, but you can also enjoy it in just your everyday clothes and a pair of good, sturdy, comfortable shoes or boots. The only cost is getting out into the country. It also requires absolutely no experience. The only thing required is to follow a trail. Later, if you become more experienced and wish to do so, you can buy maps and use those to guide your hiking, but it’s not necessary. Ultimately, all you’re doing is using your legs, the same way man has been doing for thousands of years. It’s the first form of transport, and still generally the most reliable. At some point in your life you will almost certainly hike. You might become one of the growing number that enjoys it so much that you begin doing it regularly, for any, or even all of the reasons listed above. In the end, why you like is isn’t important – it’s the pleasure that counts.